Daniel Craig, Olga Kurylenko, Mathieu Almaric, Gemma Arterton, Judi Dench, Jeffrey Wright, Giancarlo Giannini, Anatole Taubman, David Harbour, Joaquin Cosio, Fernando Guillen Corvo, Jesper Christensen, Rory Kinnear, Tim Pigott-Smith. 106 minutes. QUANTUM OF SOLACE, the 22nd ‘official’ James Bond film, was a huge financial success, but was considered disappointing after the critically heralded and box-office hit that was CASINO ROYALE (2006). It had a lot to live up to. Like TOMORROW NEVER DIES (1997), Pierce Brosnan's second 007 picture, it had the task of following up a film which had breathed new artistic and commercial life into the series (GOLDENEYE, 1995). CASINO ROYALE engendered arguably the most critical acclaim of the series and was a blockbuster to boot (non-inflation adjusted, the biggest grossing of the series). It was the series' first 'reboot' and a film that, in the shape of the excellent Daniel Craig, took the series back to the more real-world, ruthless, complex portrayal of the character that Timothy Dalton had begun with his two films THE LIVING DAYLIGHTS (1987) and LICENCE TO KILL (1989). The title of the film stems from a W. Somerset Maugham-inspired short story written by Ian Fleming that appears in the 'For Your Eyes Only' collection of Bond stories, published in 1960 (UK: 11th April; US: August). It was first published in 'Cosmopolitan' magazine in November 1959 (or according to Henry Chancellor in his book 'James Bond: The Man and His World', in 'Modern Woman' the same year), and according to Chancellor was based on a true story told to Fleming by his mistress in Jamaica, Blanche Blackwell (mother of Island Records supremo and DR. NO location scout Chris Blackwell) about a police inspector (renamed Philip Masters in the story). Fleming bought her a Cartier watch to show her his gratitude. The story is perhaps one of the most personal Fleming ever written. It is indicative of his love for Maugham's writings. Wesley Britton notes in his excellent article 'Seeking a Quantum of Solace: From W. Somerset Maugham to Daniel Craig', that they were close friends, had similarities as people, wrote nice things about each other's work - and that Maugham was the one who insisted Martinis should be 'shaken, not stirred'. Britton also points out that there are elements in Maugham's work that probably inspired Fleming's novels, and that, according to biographers, the story also reflects his turbulent marriage to Ann Rothermere (Ben Macintyre) and the 'harsh realities... of colonial life in the tropics' (Andrew Lycett). He also notes that at 'the heart of the tale...is the question of boredom and alienation, and how to escape from this, which was something of a running theme throughout Fleming's novels and particularly interested the author. Fleming's hero was often worried about going stale, as was Fleming himself.' Henry Chancellor sees parallels between 'Quantum of Solace' and Maugham's story 'His Excellency' from his collection 'Ashenden, or The British Agent' (1928). A read of the story leaves little room for doubt. Apart from the obvious similarities, it's also interesting in that Maugham's tale is a typically realistic view of espionage at odds with Fleming's. John Le Carre was influenced by Maugham, and the two could hardly be any different in outlook from Fleming. The movie version of QUANTUM OF SOLACE would also present a view of espionage more in keeping with the cynicism and disillusionment of Maugham and Le Carre. Two of the stories from 'Ashenden, or The British Agent' ('The Traitor' and 'The Hairless Mexican'), were adapted into the Alfred Hitchcock film SECRET AGENT (1936). Hitchcock's NORTH BY NORTHWEST (1959) was one of the models for Harry Saltzman and Albert R. 'Cubby' Broccoli when they began their series of James Bond films in 1962 with DR. NO. 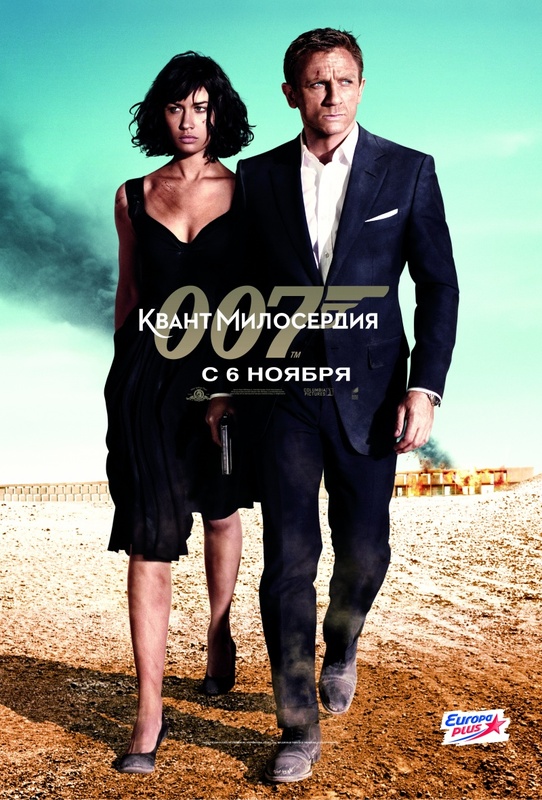 The film began shooting with the working title of 'Bond 22'. 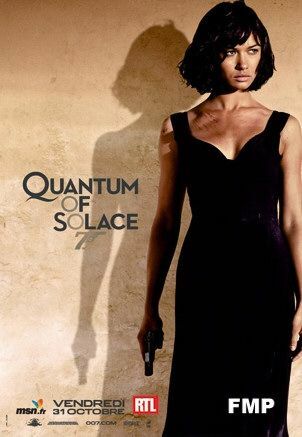 QUANTUM OF SOLACE was announced (at Pinewood Studios, home of the 007 Stage) as the title on 24th January 2008, seventeen days after the official start of principal photography. Daniel Craig helpfully explained a title that got as much a cold reception as his initial casting announcement in CASINO ROYALE, telling The Guardian that after the death of Vesper in CASINO ROYALE 'Bond is looking for his quantum of solace and that's what he wants, he wants his closure'. Interestingly, at the end of the Fleming Bond novel 'You Only Live Twice' (1964), Bond becomes the father of a child with former Japanese Hollywood starlet Kissy Suzuki (whilst suffering amnesia and believing himself to be a Japanese fisherman named Taro! ), but never gets to find out. The short story 'Blast from the Past' (1997), written by Raymond Benson, is a direct sequel to the story and reveals that the child was a boy. The 'revenge' aspect of QUANTUM OF SOLACE would give the series the opportunity to explore Bond avenging the death of a woman he loved. In the movie version of ON HER MAJESTY'S SECRET SERVICE (1969), Bond's bride (Tracy) was murdered on her wedding day, as she was in the 1963 novel. The following film, DIAMONDS ARE FOREVER (1971) had a different actor playing Bond (Sean Connery returned for the first time, replacing John Gavin who had been signed up), and it was decided not to pursue the revenge angle (apart from in the pre-credits sequence where an angry Bond tries to hunt down Ernst Stavro Blofeld, whose henchwoman Irma Bunt had killed Tracy in O.H.M.S.S., which doesn't necessarily follow on from the previous film, there are no indications of this being a sequel to the previous film). It is possible to read into Bond's vengeful state of mind in LICENCE TO KILL that it is not Felix Leiter's maiming at the hands of the villains that tips him over the edge but the death of another innocent female that he failed to protect on her wedding day (Della, Felix's bride). There is a reference to Bond's marriage before the villains catch up with Leiter and his bride (Felix: 'He was married... but it was a long time ago'), and after 'M' reprimands Bond for getting involved in finding those responsible, Bond does angrily exhort 'And his wife?'. But it isn't explicitly stated in the screenplay. Forster stated he was 'pretty happy' with the quality of the script that was filmed in January and February (the strike ended on February 12th), but Joshua Zetumer, who had written a spec script that had impressed Forster, was brought on to fix up the later part of the script, which would cover the rest of the filming schedule. Dialogue was apparently written by him depending on the ideas of the actors each day, and Forster liked to rehearse because of his fondness for continuous scenes. The fear of failing to live up to, and capitalise upon, CASINO ROYALE must have never been far too away from their minds. Also impacting on the script were budget constraints imposed by a studio financing a follow-up to ROYALE that would cost $50m more (ROYALE had cost $150m). This resulted in the scrapping of Forster's idea to shoot in 'fabulous' and 'romantic' Peru for ten days in March 2008. One of the highlights of the movie, the rooftop chase in Siena, was nearly left out of the picture until Forster convinced everyone that it could be filmed on actual rooftops rather than rooftops being built at Pinewood. Forster had insisted on filming mainly on location, and as a result, SOLACE would be the most globe-hopping of the series, visiting seven countries. Filming on location added to the expenditure and also placed additional stress on the filmmakers. ITALY: The opening car chase was filmed on the twisty roads, quarries and towns around Lake Garda (including Malcesine,Tremosine and Limone) during April and May 2008. The car chase resulted in two injuries involving stuntmen, one of the stuntmen being in critical condition for a period of time. On top of this, an Aston Martin mechanic driving a DBS to a press event lost control and ended up,unhurt, in Lake Garda. Second-unit footage of the bi-annual Palio medieval horse race in Siena had been captured on 16th August 2007, some six months before the official start of principal photography), with Daniel Craig watching from a hotel window. At that time, it still wasn't even clear how the race would be incorporated into the film. Second-unit filming of the rooftop chase in Siena had started in February 2008 and had taken eight weeks; the first unit started filming in April. Instead of emerging out of the underground tunnels via the fountain of the Piazza del Campo in the middle of the Palio race, Bond was originally meant to emerge through the Duomo di Siena cathedral. This idea was rejected on the grounds it would have been disrespectful. Mathis's beautiful villa was shot in Talamone, Tuscany, and is a privately-owned stone building dating back to 1, 000 AD (it was originally built as a fort). The U.K.: Fourteen sets were built at Pinewood Studios, including the MI6 safehouse and art gallery rope fight from the Siena location; Bond's hotel room in Bolivia, the new, stylish HQ of MI6, and the explosive climax set in the desert (it was the last filming of the movie). Daniel Craig managed to get kicked in the face in an action scene, the gash necessitating eight stitches and plastic surgery. He also sliced the top off of a finger filming the climax. The extensive location filming in the UK would encompass the Sculpture Garden outside the Barbican Centre in London (for the scene when 'M' and Tanner speak to Bond via cellphone whilst he is in Haiti - Tell her he was a dead end! '); the exterior of the Water Gardens block of flats in Burwood Place, London (Craig Mitchell's abode); the Bruneval Barracks in Aldershot (for the last scene of the movie set in Kazan, Russia - another part of the base had been utilised for the hovercraft chase in DIE ANOTHER DAY, 2002); Farnborough's TAG airport (Greene's meting with the CIA on a private jet and Bond getting his credit card rejected);the Bodyflight building in Bedford (Craig and Olga Kurylenko trained there for quite a few weeks with the stunt team for their freefall skydive sequence before doing one day's filming); 'The Base', Virgin Atlantic's training facility in Crawley (Bond and Mathis's deep conversation on the plane to Bolivia, where 007 drinks six 'Vesper' martinis and has his first ever drunk scene!) and The Reform Club in Pall Mall, London (previously the location of the sword fight in DIE ANOTHER DAY, this was used for 'M's confrontation with the Foreign Secretary, played by Tim Pigott-Smith). PANAMA/ CHILE: Panama (Old Town, Colon, Panama City) doubled for Haiti and some of the scenes set in Bolivia (including Bond's luxurious hotel, actually the Inac Building in Old Town, Fields greeting Bond and Mathis at the airport, and the scenes where we see Leiter and Beam in their impromptu office and then Leiter meets Bond) in February. All the desert scenes, despite representing Bolivia, were shot in the Atacama Desert in Chile, during March and April. The eco-hotel (Perla de las Dunas) is actually the Paranal Observatory in the Atacama Desert, some 6, 000 feet in altitude and entailing a two-hour trip for the cast and crew to the location. The location's airstrip was also used in the aerial dogfight scene. Bad weather conditions forced the cancellation of action scenes to be filmed at the Incan Citadel of Macchu Picchu in Chile. The (suspended) Mayor of Sierra Gorda in Chile disrupted filming in Chile, protesting his country doubling for Bolivia in a few scenes. SPAIN: Unspecified filming took place in Madrid in the last week of April. AUSTRIA: The Bregenz scenes were shot on real location and entailed two weeks of night shoots at the city's Festival House from late April to May. Bond's driving scene in Austria was shot in the Austrian state of Feldkirch. MEXICO: The aerial dogfight was filmed in Baja California, in Mexico in January and February, for seventeen days, with a crew of 66, under the direction of Dan Bradley. Despite the fact that the film was a shorter shoot than usual, and didn't go over its 103 day schedule, one can easily imagine the cast and crew hoping that the end of production (Pinewood Studios, 22nd June 2008) and the release of the movie would bring a 'quantum of solace'. 'Agent of Change' by Logan Hill, New York Magazine site, 2nd November 2008. 'Bond 22 Delayed', Total Film site, 25th September 2006. 'Bond 22 Plot Tossed Out?' by Matt Weston, Commander Bond site, 12th October 2007. 'Bond Update: Bond 22 Cast Talk! ', Total Film site, 24th January 2008. 'Casino Royale Shanghai Premiere' (report), MI6 site, 30th January 2007. 'Everything Changes But Bond' by Mark Brown, Guardian UK site, 24th January 2008. 'Forster Back in Action with Bond 22' by Tatiana Siegel/ Borys Kit, Hollywood Reporter site, 20th June 2007. Paid access section. 'For Your Eyes Only' (compendium of short stories, specifically 'Quantum of Solace' and 'For Your Eyes Only') by Ian Fleming, Jonathan Cape, 1960. 'Haggis Has Bond’s Number Again' by Jay A. Hernandez, L.A. Times site, 23rd May 2007. 'How James Bond Nearly Became a Father' by Logan Hill, Vulture site, 3rd November 2008. 'Los Angeles Film Festival - Directors Marc Forster and Paul Haggis Talk "Bond" Over Coffee' by Fred Topel, Hollywood.com site, 5th July 2007. 'My Work is My Bond', Mail and Guardian Online site, 27th November 2008. 'New Bond Film Title Announced', BBC News UK site, 24th January 2008. 'Paul Haggis Talks Bond 22' by Steven Chupnik, Coming Soon site, 25th August 2007. 'Quantum of Solace - Bond Done Differently' by Matt Weston, Commander Bond site, 12th November 2008. An overview of a Hollywood Reporter article that is currently offline. 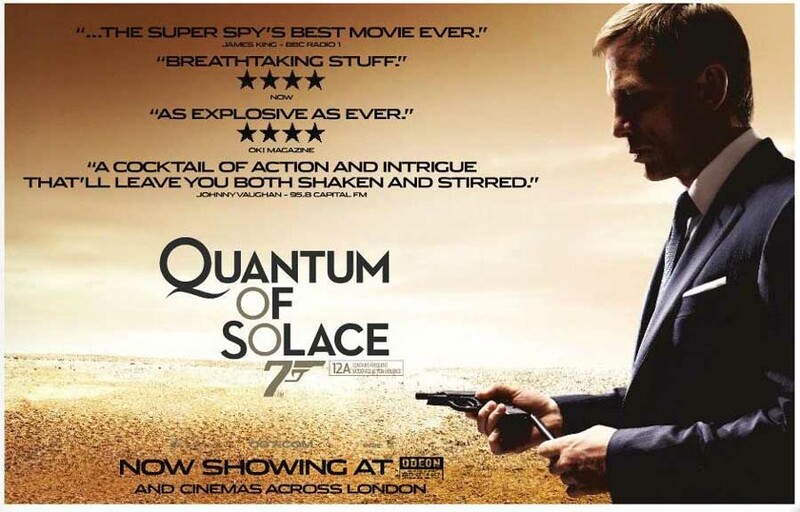 'Quantum of Solace is Marc Forster's Art Film' by Randee Dawn, Hollywood Reporter site, 11th November 2008. Now part of the paid access section. Can be read here. 'Quantum of Solace - Marc Forster Answers Your Questions' by Ben Childs, The Guardian UK site, 21st September 2008. 'Roger Michell Discusses Turning Down Bond 22' by Devin Zydel, Commander Bond site, 4th June 2007. Interview originally appeared on The Times site, but latter is now a paid access site. 'Roger Michell in Talks for Bond 22', The Hollywood Reporter site, 17th July 2006. Currently offline. Report on the news here. 'Seeking a Quantum of Solace - From W. Somerset Maugham to Daniel Craig' by Dr. Wesley Britton, Dr. Shatterhand's Botanical Garden Site, 2008. 'The Script - Drafting a New Bond' by Stax, Rotten Tomatoes site, 4th April 2008. Paul Rowlands is a Japan-based writer. After completing a BA Humanities course (majoring in English and Science) at the University of Chester, he moved to Japan in 1999. He writes for the James Bond magazine, Kiss Kiss Bang Bang, and has had an almost lifelong obsession with cinema, something the advent of DVD only increased.